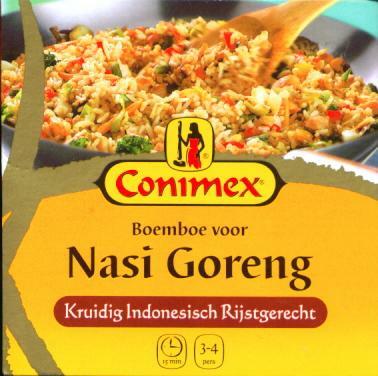 Conimex Tub 01 Nasi Goreng Mix 100g - Conimex - The Dutch Shop LLC your store for Dutch groceries. Ingredients: onion, vegetable oil, water, salt, vegetable bouillon flavor, sambal oelek (red pepper, salt, lactic acid, water), garlic, galangal root, coriander, soy sauce (water, soybean, salt, wheat), vinegar, dextrose, malto-dextrin, cumin, tomato puree, hydrogenated vegetable oil, ginger, monosodium glutamate, modified corn starch, trassie (prawn extract) turmeric, potassium sorbate. Contains: wheat, shell fish, and Soy bean products. 14 oz. /400g of diced pork or chicken breast.